You’re the smartest computer in the world and proved it by beating your human opponents at a thinking man’s quiz show. Now what do you do? For IBM’s Watson computer, cooking lessons are next on the agenda, along with dabbling in the medical and pharmaceutical industry, and helping with mining operations in Australia. 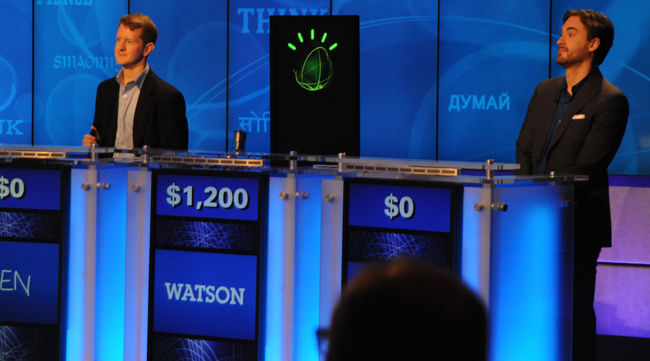 According to the New York Times, IBM showed off the future of its Watson computer to financial analysts in San Jose, California, today with the goal of proving that Watson is as perfectly suited for commercial applications as it is for Jeopardy applications. Watson hasn’t been a huge money-maker for IBM, which is why the company is looking for more commercial jobs for the technology. IBM will demonstrate how Watson can help develop drugs, determine when heavy machinery is due for preventative maintenance, and even help concoct inventive ingredient combinations for chefs. Finding out what doesn’t work is a critical component in developing new drugs. GlaxoSmithKline and IBM have begun working together to see how Watson can help the pharmaceutical company develop new solutions. In a way, it’s like having the one guy in the room who can always look at a problem from an outside perspective and think outside the box. Pun intended. Chef Briscione compiled the ingredients, added vegetable oil, and produced a tasty Spanish crescent. While Watson isn’t stepping up to the oven just yet, this shows the kind of collaboration and creativity that Watson is capable of. We’ll admit, it’s scary to think of a computer as creative, but if Watson learns how to make a strong cup of coffee with a dash of milk for us, we just might accept it as our new overlord.